Marcus Luttrell and Patrick Robinson's non-fiction book published in 2007 about the failed US Navy SEALs mission called Operation Red Wings is brought to the big screen by writer/director Peter Berg (Battleship, Friday Night Lights, and Hancock). Luttrell and several other Navy SEAL veterans worked as technical advisers and multiple branches of the US Armed Forces aided in the production. Even the major actors in the film endured three weeks of military training to prepare for the physical demands. The battle sequence in the 2nd half of the movie, are brutal, bone crunching and unrelenting giving the viewer a more appreciative understanding of the sacrifices made by our men in uniform. 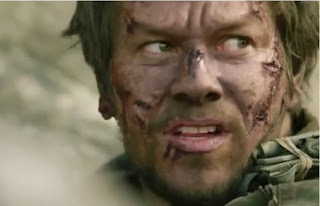 Mark Wahlberg who also has producing credits on the film plays Marcus Luttrell. The first half of the movie details the extensive training of the SEALs. It's been done on numerous other movies, so it's almost redundant, but it helps set up the camaraderie of Luttrell and his teammates. Taylor Kitsch as Lt. Michael P. Murphy, Emile Hirsch as SO2 Danny Dietz, Ben Foster as SO2 Matthew Axelson, and Eric Bana as LCDR Erik S. Kristensen. The team's mission is a recon to confirm the location of an important Taliban target, Ahmad Shah (Yousuf Azami). The team must drop in by jumping from a helicopter to the location then hike up the slippery shale mountains to observe and report. What they find is more than the 10 men anticipated by their intel. While waiting for further orders they find themselves dug in near a goat trail and their location is compromised by 3 men and a child herders. Their radio is not working properly due to the terrain so they are left on their own to determine the fate of their captives. “Terminating the complication” seems to not sit well with everyone. They eventually let the goat herders go, but the that's when the consequences of their actions hits the fans. They underestimate the time the young herder can descend the mountain to warn of their presence as they move up the summit to get better radio reception. The last half of the movie details the intense and realistic close counter fire fights in harsh conditions as the men battle to survive. It's a “edge of your seat” type of action that doesn't let up until the end. As the title says, it's Lone Survivor. Even though you know only Luttrell comes out to tell the tale, it doesn't diminish the eye witness account of what happened. Berg had talked personally to the families of the fallen soldiers to make sure that proper respect was paid to them. Berg also embedded with a Navy SEALs team, the first civilian to do so, for a month in Iraq as he wrote the script. And Luttrell moved in with Berg's home for a month as a consultant. The brotherhood of bravery is an homage to not only to those lives lost on this mission but to all our men and women serving this country.